What would a photo show to illustrate a margin in a Bible? Thinking about a snapshot to reinforce a section of Scripture helps to cement that for us to remember. Images can be traced or drawn free-hand. They can also be mixed with typography- words. There are a multitude of artist renderings from "in the margins" to full page drawings. Margins may be preprinted and added to a Bible. We appreciate the wide variety of images. I first started incorporating visual elements in my Bible reading after seeing how Connie was doing some simple highlighting and lettering, or making notes in the margins of her Bible, responding to the text. I was intrigued. I was intrigued for about a MONTH before I was brave enough to try it for myself … and I started in the margins of a Concordia Psalter. Then I tried using a calendar template to record my response to a devotion and Scripture reading. I used a fine Sharpie and some colored pencils to summarize the daily reading using a few words or an image. My goal was not to make them “pretty” but to make them MINE. Responding in a visual way helped me remember and review what I had read. I found myself spending more time in His Word, reflecting on what it said to me, and responding to His grace for me in a creative, colorful way. Sometimes I use a journaling or coloring Bible. I have expanded to filling journals with lettered Scripture and sermon notes. These devotional practices may also include time for "praying in color". I have choices and I don't do them all at the same time! I advocate starting with one thing and building from there, making wise choices so it continues to be a a joy-filled process. Learning about Visual Faith has lead me to opportunities for teaching visual faith prayer and facilitating classes and leading retreats. As a creative and a guy it can be difficult to express myself. Of course, though, as a Christian, I typically only want to express my faith. While I enjoy writing, I prefer visual communication. I am love with His Word, as all Christians ought to as Scripture shows us. The problem is that the bible isn't academic- or at least not JUST academic. It's living and is God's Truth and Character spoken to us. When I write, draw, sketch and design in my bible is usually only for the following reasons: To give me reminders, to write down notes from a sermon or teaching, to give me actual information about a Greek or Hebrew word via a word study, or to simply express how a passage makes me feel and if only God sees then that is completely fine by me as it may have been meant simply for Him and for Him alone. The Christian life is messy. We are messy people serving a perfect God. We are forgiven but yet God has still created us with the blessing/curse of humanity. My journaling, while hopefully interesting, is certainly not pretty. I use ball point pens, spill coffee on it, scratch stuff out, and often have misspelled words. While I may create a hand drawn font (instead of using my own terrible hand writing) the font still is what I consider to be "scratchy" and definitely unpretty but certainly just as honest and sincere. I do enjoy using texture and lighting to enhance my designs. If I mess up, I can create a texture, usually a weathered or cracked texture to, ironically enough, cover up the mess. Darkening a mishap and creating a shadow, again, ironically "hiding" my mishap as we all like to do in our own lives, is a nice way around errors. While imperfect in design, the message itself is still true and perfect. It creates a gritty but all the more honest and real approach to the perfect Jesus coming into our lives and still preaching the message of truth through us despite our imperfections. When it comes to the notes from teachings, I don't try to have pretty writing. It takes too long. I try to write slow then add emphasis to different words by making them larger or bolder. Having the notes right there in my bible to be seen as I am reading them seems to make so much more sense then separately on a lose leaf sheet of paper or tucked away in a journal. Whether you journal or not, every christian should be spending time in God's Word. It's imperative to our spiritual growth that we do so. Not so that we can become more holy but simply because we get to know Him more instead of simply knowing more ABOUT Him. Bible journaling has transformed my relationship with Scripture and my outside world. I now seek God's Word in what I see and I see images in the passages I read. The Bible has become very real, very alive and richly embedded in my day-to-day life. 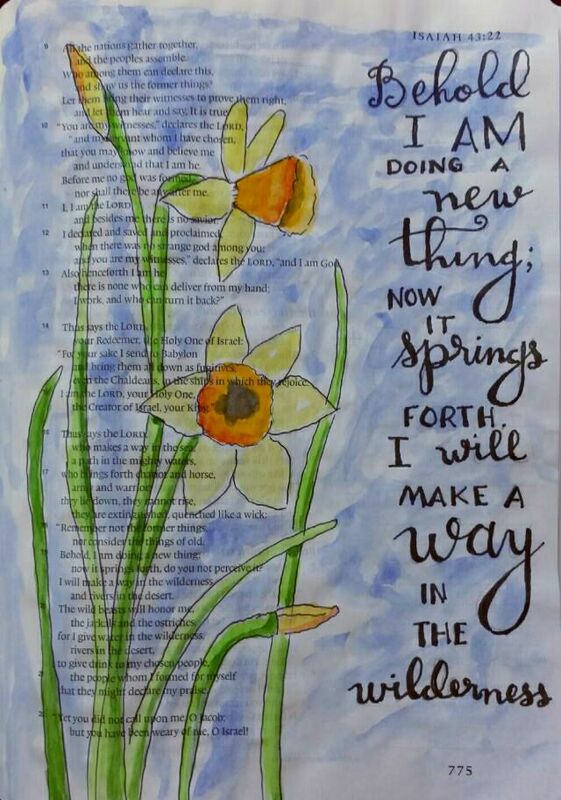 Bible journaling has taught me to read, mark, learn and inwardly digest Scripture. For the past 6 years my family has vacationed at Camp Arcadia, in Arcadia, MI, on the shore of Lake Michigan. We continue to return because of the real rest and peace we experience during our week's stay. Pat Maier created a coloring book to commemorate camp and I borrowed her shoreline picture to trace in my bible. The tracing was done at the end of our 2016 summer. I waited until our 2017 visit to color it. I sat outside the Inn, with the waves to my back and the sun on my skin. It was an amazing experience. I paired the picture with Matthew 11:28-30. 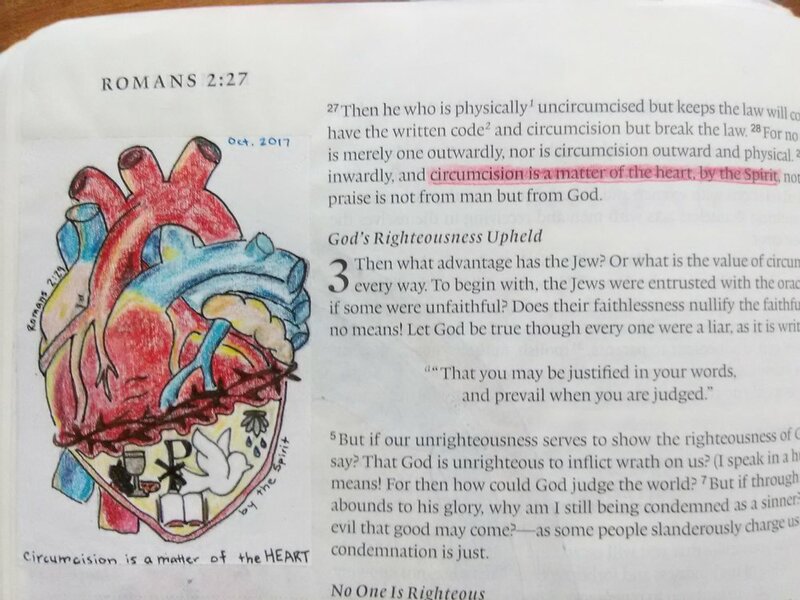 When I stumbled on Romans 2:29 in my current Bible study, I was blown away by the imagery of a circumcised heart. What might that look like? How would a believer's heart look different than a non-believe? I chose the crown of thorns to mark the cuts of the circumcision and revealed what is inside my heart: the body and blood of Christ, the Word of God, the Holy Spirit, Christ and the saving power of baptism. My husband and I had the opportunity to travel to Anchorage, Alaska, last February, for the baptism of our niece and Goddaughter Vivian. Of course Alaska, that time of year, is a wonderland of beautiful snow and sub-zero temperatures. I brought my bible journal on the trip and created this entry for Job 37:6. The snowflakes were inspired by a Winter Carnival poster my daughter's school hosted that same month. “As far as the east is from the west…” These are powerful words, but what I love even more are the verses right before this one, “as high as the heavens are above the earth, so great is his steadfast love.” I chose the compass to show the extensiveness of his love and forgiveness as the lines pointing out away from each are never ending. That’s God’s amazing love for us! “You are the light of the world” This verse has a special meaning for me this year especially as my school was greatly affected by the Hurricane Harvey. Our theme verse is Matthew 5:16, and our theme is “SHINE” as we let our light shine before others. Throughout the flood and storm, our school continued to be a light for the Houston area. Despite our own devastation, we have seen God’s light in the darkness. “Hosanna in the highest!” Palm Sunday has always been one of my favorite Sundays to worship and recognize the beginning of Holy Week. I have many fond memories of this day as my church growing up always has Confirmation on this sacred day. Whether it was my confirmation or other church members throughout the years, I love that we celebrated the two together. The image is a great reminder of the joy and light that Jesus brought to the people. Imagine trying to keep warm in bed before central heat! Having a warm hubby is nice. My hubby is a human furnace! But I think this concept applies to more than warmth. Having a partner in life is a blessing, especially if they follow Christ. For those that are single, widowed, or divorced, Jesus is a wonderful spouse. I have friends who brag on how he takes care of them better than an earthly husband. In Scripture, the palm is always the date palm, stately and beautiful. It has extremely deep tap roots—called a root ball—and thus can flourish even in the desert, growing tall and living long. It is perhaps the most useful of all trees, not only producing dates, but also sugar, wine, honey, oil, resin, rope, thread, tannin, and dyestuff. Its seeds are fed to cattle and its leaves are used for roofs, fences, mats, and baskets. Its fruit is said to get sweeter as the tree grows older. May we all flourish like those date palms and produce sweeter and sweeter fruit for the Lord, even in our old age! One Spring morning in my 15th year, my father and I were getting in the car to go to church early, as we sang in the choir together. He asked me, "Do you notice anything?" I looked around the driveway and said, "No." He said, "Look! The daffodils are starting to sprout!" He talked to me about how important it is to pay attention. When God is doing something new, we might miss it if we're not paying attention. I just returned from a month long painting trip, living in my van. When I got home, this is how I felt about seeing my husband, who I missed so much.